When compared to other types of vacations, cruises tend to be more affordable than people think. This is because they are all-inclusive, meaning your food, lodging, and entertainment are all included in the price. You'll be responsible for your airfare and extras such as alcohol, souvenirs, and gambling at the casino, but if you want to be frugal, you can still enjoy your cruise vacation a great deal just by partaking in the included aspects. That's all very well and good, you say, but what's the bottom line: how much do cruises cost? Incredible Deals on the Best Cruises! Last-Minute Sailings from $199! If you can get away for more than a week, chances are you'll love a longer cruise. I took a 10-night Mexican Riviera cruise in December, and there were several aspects that made it an even neater vacation than the 7-night Mexico cruise we took the year before (when you live on the West Coast, Mexico is a popular cruise destination). When it comes to booking cruises, I'm a Travelocity junkie and I'm always surfing their site for good deals. The Mexican Riveria cruises already tend to be quite affordable, but I noticed this year that you could sometimes find 10-day cruises for the same price as 7-day cruises. That's why I originally booked it. We got a balcony room for about $1,000 ($500 a piece), which isn't bad at all for more than a week. With extra days, your cruise will visit extra ports, often ports that are a little off-the-beaten path. The 7-day Mexican Riveria cruises tend to hit the same three ports: Mazatlan, Cabo San Lucas, and Puerto Vallarta. With extra nights, you get to see those places but a couple more as well (we went to Ixtapa--beautiful!--and Acapulco). This was something I really appreciated since I could compare my 10-night trip with the 7-night one from the year before. We ended up landing in the typical ports on different days than the 7-night cruises did, so the crowds were a lot smaller (there was always at least one other cruise ship in port when I was on the 7-night cruise). As a non-shopper, I appreciated that fewer people had turned out to hawk their wares on the docks. In addition, our ship was a little smaller (fewer people can get away for 10 nights, so they don't need as big of a ship), so lines for tendering and everything seemed shorter. I don't have anything against kids on board, but if you find yourself grimacing because there are always a few horsing around in the hot tub, you might appreciate the longer cruises. If you sail during the school year, you'll find fewer parents willing to take their kids out of school for more than a week. Longer cruise = longer vacation = longer time to work on your tan = longer time away from work. 'Nuff said! Which Cruise Lines Are Best for Which Elements? There are 7 big cruise lines that are the major industry players, and which (if you're into the cruise world) you've probably heard of. These are Carnival Cruise Lines, Celebrity Cruises, Costa Cruises, Holland America Line, Norwegian Cruise Line, Princess Cruises, and Royal Caribbean International. So, which is best? I have to admit that I haven't been on all of them (yet! ), so I'll refer to the Berlitz 2009 Complete Guide to Cruising & Cruise Ships to answer this question. Each line has its own specialty, so which is "best" will depend on what you're looking for. Carnival is known for "all-round fun, activities, and casinos for the lively youth market" though the guide book points out that many of their passengers are over 45. These guys are said to have the best food and the most elegant ships and spas. All that considered, the guidebook considers them under-priced. Costa Cruises features a European style with multi-national passengers and a lively ambiance, so if you're looking to escape your countrymen, this may be the place to see folks from different cultures. These guys are popular with seniors and retirees, thanks to their "smiling service staff, lots of flowers, traditions of the past, good cooking demonstrations, and alternative grill rooms." 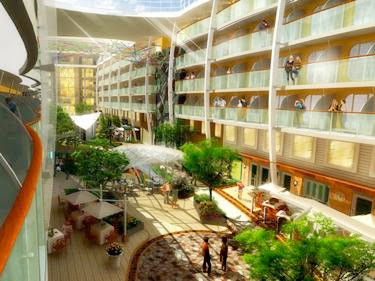 NCL is known for affordability and is often recommended to first-time cruisers. They have a good choice of dining experiences and solid entertainment. The book says Princess has "consistent product delivery" (I'm not sure how much of an accolade that is!) and informs us that the decor tends to be bland and the passengers older. These guys specialize in the Caribbean (no surprise there) and offer a good experience for first-time cruises and families. They have a good variety of entertainment and children's programs that will keep the young-uns busy. I'm fortunate enough to work from home and be able to take vacations without giving anyone notice, so I love booking last minute cruises. If you're retired, self-employed, or just able to get away on short notice, you can save quite a bit booking last minute. Cruise ships don't like to sail with empty cabins, so they will slash rates in the weeks leading up to the departure date to ensure as many money-spending passengers are on board as possible. 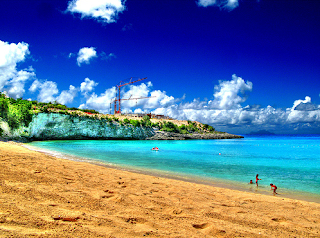 And the Caribbean is a fantastic destination (and a great place to find deals, especially in the summer). Fewer people choose to vacation in the Caribbean during the summer -- We're often looking to beat the heat in the summer, and choose cooler vacation spots such as Alaska or Northern Europe, but the Caribbean is a lot like Hawaii in that it may actually be cooler and more pleasant (i.e. "perfect year around") in the summer than say Texas, Georgia, the Midwest, etc. Tropical climates rarely get above the 80s, making the temperature perfect even in July and August. People are concerned about hurricanes -- Folks know summer as the beginning of hurricane season, but it doesn't really kick into full gear until September or so, so there's little reason to worry about cruising the Caribbean in the summer. Even if there is a hurricane, a ship has a lot easier time steering clear of the weather than a hotel on land! And if you're booking your vacation last minute, you will probably already have an idea of what the weather is going to be like, as tropical storms can be predicted quite a ways in advance. People have the kids and don't think cruises are good family vacations -- In the summer, you have kids out of school, and a lot of folks assume cruises are just for romantic getaways for mom and dad or retired couples, but in truth, you can find kids of all ages on cruise ships. 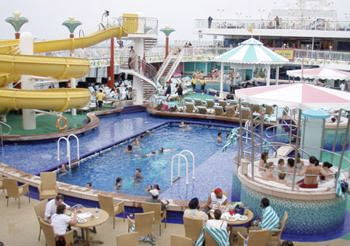 All the big mainstream ships have great kids' spaces which can include skating rinks, teen computer rooms, pools with slides, and other amenities for children, so you can indeed take the kids on a Caribbean cruise, and you can count on them having a good time. All of these misconceptions about cruising the Caribbean in the summer serve to our advantage, because we're presented with great rates as cruise lines seek to attract folks. Add the deals you get when booking last minute on top of that and you can get a fantastically affordable vacation (and, for the record, "last minute" can mean a few weeks in advance--the prices start to drop as far out as a couple months, so you don't literally have to be packed and ready to go at a moment's notice). I just keep an eye on sites such as Travelocity, where bookings (prices and what cabins are left open) are up-to-the-minute for all the major cruise lines. Prices can change from day to day, so it pays to check back frequently. Also, if you have a favorite cruise line, signing up for their newsletter can also keep you appraised of last minute deals. So far I've only taken cruises on the ocean, but I'm definitely planning to try some river cruises in the near future. After we do Alaska this summer, that is! Lots of outfits send ships up and down this famous European river, and you can book sailings for anything from a couple of hours to two weeks or more. The Amsterdam to Strasbourg run is a popular one, and you can book with Euro River Cruises for just about any week during the primary tourist season (April through October). 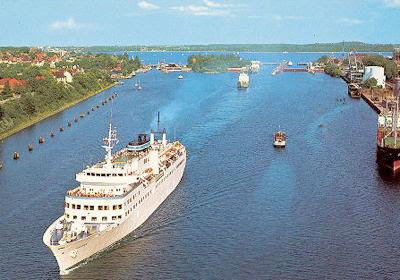 As with ocean-going cruises, prices include most of your room, board, and transportation expenses: "Full board cruise from dinner of the first day to the lunch of the last day in a double cabin with shower and toilets, welcome drink, entertainment, the Captain's Evening, the assistance of our hostess on board, and port taxes." Click the link above for an itinerary and more information. If you've never been to Eastern Europe, then a cruise through Ukraine to the Black Sea would be a unique experience. Visit the Land of the Kosacks by river boat. Smart Tours offers Ukraine cruises with prices starting at $1400 (including air fare from New York) for 11-nights aboard the MS Dnieper Princess cruise boat in an outside cabin on the Lower Deck, with private bath. "The first class MS Dnieper Princess was built for cruising the Ukrainian Waterways and can accommodate 240 guests. All cabins are river facing and cozy, with two lower beds and a private bath/shower." Visit their site to see a sample itinerary. 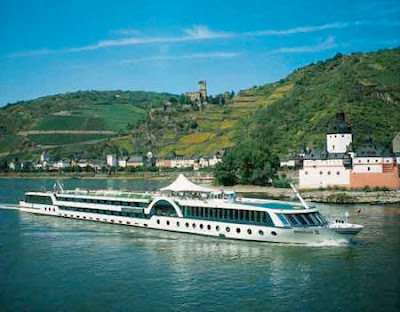 While you may think of cruises as something to be done in the warm weather of late spring and summer, this particular cruise, put on by Viking River Cruises, departs later in the year. "Celebrate a variety of Central European countries in just 8 days, and mingle with locals as they prepare for the holidays during this refreshing cruise along the storied Danube. Get a taste of Germany in beautiful Passau. Cruise through Austria, stopping in riverside towns along the way, and enjoy a full-day excursion to picture-perfect Salzburg. Experience the Old World capitals of Budapest, Hungary and Bratislava, Slovakia." Here's a vacation for those who don't want to settle for one river. Hosted by Avalon Waterways, this vacation hits four countries, three rivers, and the Main Danube Canal. 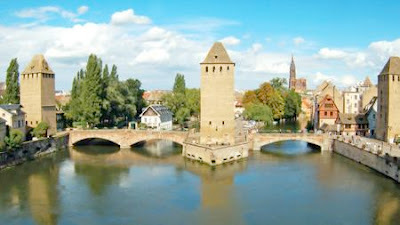 "Start in Zürich, Switzerland, then enjoy guided sightseeing in the cities of Strasbourg, Würzburg, Nuremberg, and Vienna. There’s an excursion to Heidelberg with its imposing castle ruins, and a visit to the beautiful Benedictine Abbey of Melk. Guided walks of the smaller towns show you their highlights, and there’s a chance to sample some of Germany’s famous beers on this Rhine river cruise vacation." As I write this, prices run about $3500 for 2010 sailings (airfare not included). Are there any other European river cruise destinations that should be mentioned here? If you've got an upcoming cruise to Mexico, it may be canceled due to the Swine Flu breakout down there. If only some of the ports of call are in Mexico, you may be diverted to other ports (such as San Diego or Santa Catalina). According to an article in the LA Times, Carnival, Royal Caribbean Cruises, Princess Cruises and Holland America--all major cruise lines--are all making this decision. If you have a Mexico cruise scheduled for the next few weeks (or a Caribbean/Panama Canal cruise that is visiting one or more Mexican ports as part of its itinerary), you'll have to check with your specific cruise line to find out what their policy is going to be for cancellations, postponements, rerouting, etc. If you search for cruises at Travelocity or other sites that let you book cruises, you may see something called a "cruise tour" advertised in addition to regular ocean-going vacation packages. So, what's the deal? What is a cruise tour? A cruise tour is a vacation package that combines a ship-board cruise with an escorted land-based tour. For example, you might book an Alaska cruise tour which would start on a ship in Vancouver or Seattle, sailing north past those stunning glaciers and stopping in several coastal ports. 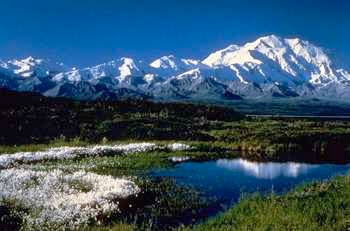 Then after perhaps 7 days, you'd leave the ship in Anchorage and travel by train or bus to inland sights such as the Denali National Park, the historic town of Dawson, and the city of Fairbanks. Cruise tours are generally longer than plain old cruises, starting at 10 days or so (at least for the Alaska area) and being as long as two weeks. For the land portion, many of your meals are included, but you'll be eating at restaurants and such instead of in a dining room that travels with you, and some meals will not be included. Lodgings and transportation are all included though, so it's still a pretty economical way to see the world.